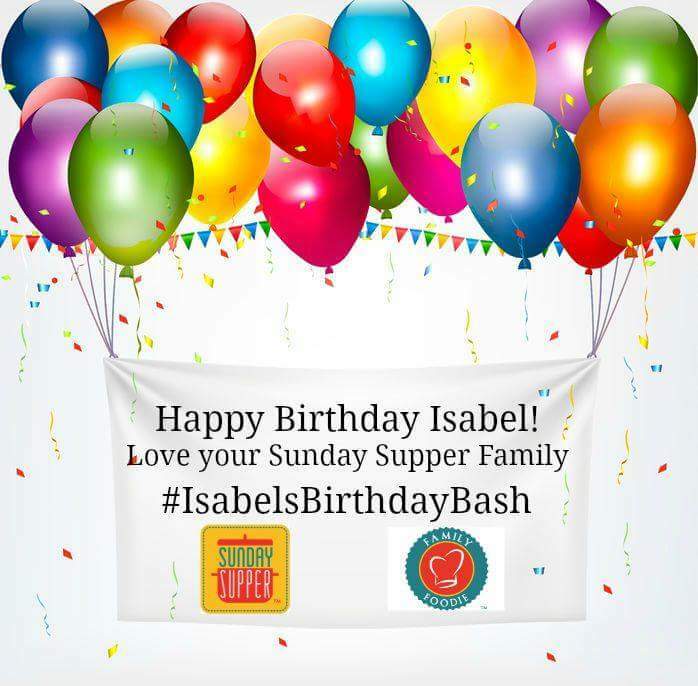 Not only is it August 4th, it's Isabel of Family Foodie & Sunday Supper's birthday! I'm proud to say that members of the Sunday Supper crew planned this virtual birthday party for the lady who tirelessly works to bring thousands, if not millions of families together each week and shares her family life with all of us. It's our turn to share with her! Someone asked a question and it was answered: Yes, let's celebrate our friend's birthday and surprise her with dishes we'd bring to a party for her! 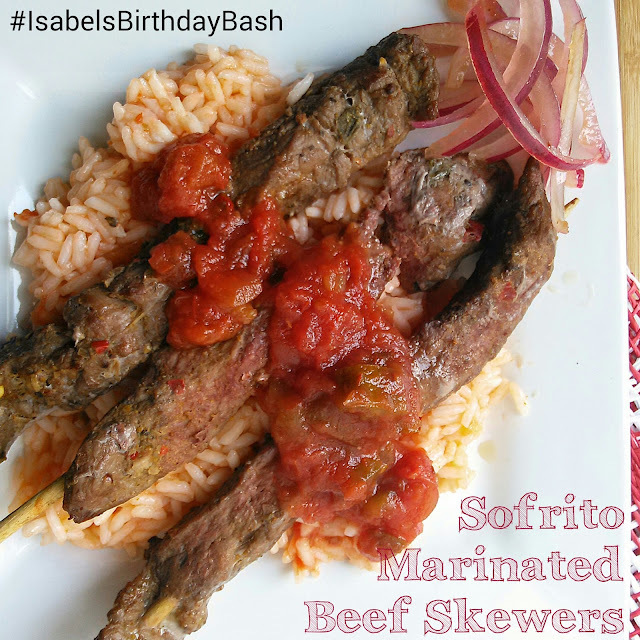 If I was able to fly down to Tampa right this minute to celebrate with you, Isabel, without a question, I'd take these Sofrito Marinated Beef Skewers! Isabel is an incredibly warm, generous (and saucy!) lady who deserves a fancy yet simple dish and recipe to share at her party! so-FREE-toe is a sauce used as a base in Spanish, Portuguese and Latin cuisines. The ingredients and preparations may vary, but it typically consists of aromatics and tomatoes that are sauteed and braised in oil. Put the garlic and onions into a food processor, then process to a chunky consistency. Put a saucepan over medium heat and add the olive oil. Meanwhile, add the thyme, bay leaf and red pepper flakes to the hot oil. Add to the pan, the garlic mixture. Crank up the heat, add the tomatoes, then cook, stirring frequently, until the edges of the pan have browned. Cook for 30 minutes, then season with salt and pepper. Place skewers in a dish, cover with water to soak. Place all marinade ingredients in a plastic bag or bowl, stir to combine. Set aside. Lay the skirt steak horizontally out on a cutting board. Cut into thin strips (1/4 to 1/3-inch thick, 1 1/2-inch wide, 6 to 8-inches long), angling the knife, cutting across the grain. 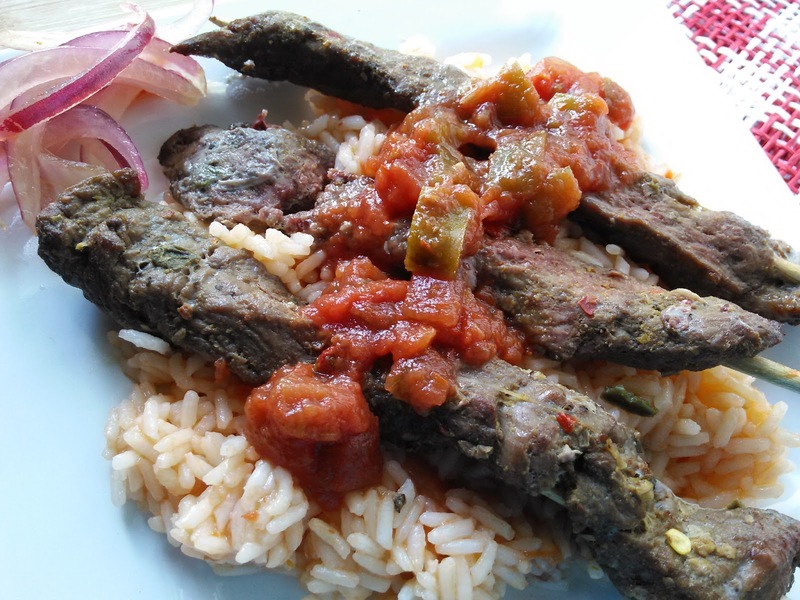 Place the steak strips in the marinade you set aside. Toss with the marinade to coat. Chill and marinate for at least 30 minutes, up to 3 hours. Thread the steak onto wooden skewers. Discard marinade. Line a broiler pan with aluminum foil and arrange the skewers on it without crowding. Position the oven rack about 4-6 inches below the broiler. Set the broiler on HIGH and place the broiler pan with the skewers on it inside and cook for about two minutes. Turn each skewer over and cook an additional two minutes. Serve over rice with reserved sofrito and pickled onions, for garnish. Yes please! Save me some of this......yummy! Why yes, I WILL take a big plate of that, please! Nikki, I shouldn't have read your post while hungry right before dinner. My stomach is growling like crazy now! I've never heard of sofrito but it looks and sounds delicious! This would be perfect for Isabel's party! Love your skewers, Nikki! A great idea for Isabel's Birthday! The perfect dish for Isabel's party. I love love LOVE sofrito!! These are some BEAUTIFUL skewers! And if I could I'd fly down to Tampa anytime to celebrate Isabel's birthday I would too. Great dish for her birthday. Perfect dish for a party and for Isabel! I'm such a masochist to be reading these posts at lunch time! These skewers look fantastic! Thank you for participating!